Dr. Tefera Tadesse, PhD, is Associate Professor of Curriculum and Instruction in the Department of Teacher Education and Curriculum Studies, Jimma University. This study was conducted to investigate the score validity and reliability of three constructs assessing student engagement, self-regulation, and psychological need satisfaction of students in two Ethiopian sports academies. A multi-method validation approach was used comprising first of expert judgment and pilot testing. 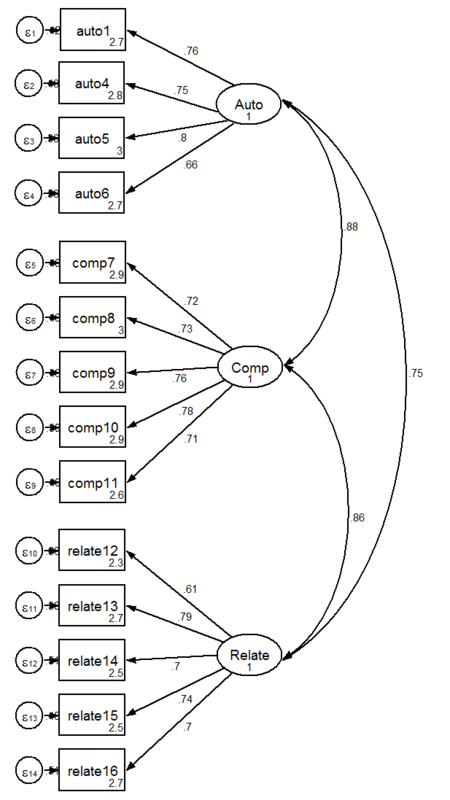 The tenability of the conceptual model was examined on student athletes (N = 257) using structural equation modeling. The main finding illustrated empirical support for the three-factor engagement model, four-factor self-regulation model, and three-factor psychological need satisfaction model. Implications of the study are also discussed. Student learning, personal development, and satisfaction are the core businesses of the sports academy (Darby, Akindes, & Kirwin, 2007; Nasey & Massey, 2004). Through participation in the sports academy programs, adolescents and youth increase their level of interest, participation, and development in the sport communities (Asmamaw, H/mariam, & Tadesse, 2016; Lewis, 2014). Also, through sports education and development programs, adolescents and youth develop into more responsible, healthy, and active members of the society (Epheraim, 2012). In tandem, these help to produce young male and female athletes trained at a standard required to participate at an elite level in local sporting arena and beyond (Darby et al., 2007). In Africa, the establishment of sports academies has been considered as a viable option to prepare African youths in sports so they become more competent to gain greater success through their involvement as professional players (Paul, 2012). Regardless of this, the positive contribution for the development of sports in Africa is constrained due to a continual migration of talented African youths to Europe and other places around the globe (Darby et al., 2007; Paul, 2012). Investigating student experience of a sport academy curriculum is crucial to understand what they do and what helped them to achieve success in learning and development of sports (Nasey & Massey, 2004). Most sport academy research has involved the perspective of the coach and coaching practices (Dorgo, 2009). More recently, institutional conditions and academic practices were shown to have the greatest influence on a number of measured student learning outcomes (Tadesse & Gillies, 2015; Tadesse, Mengistu, & Gorfu, 2016). Understanding adolescents and youth participation in sports academies may elucidate the psychological processes through which success is achieved. Research among adolescents and youth, however, is largely restricted to motivation within physical education contexts (Balderson, 2012; Brock, Rovegno, & Oliver, 2009; Richards & Levesque-Bristol, 2014), after-school program activities (Geidne, Quennerstedt, & Eriksson, 2013; Shernoff & Vandell, 2007), and summer sport activities (Jones, Dunn, Holt, Sullivan, & Bloom, 2011). The present investigation aims to expand on these known mechanisms to include a greater range of psychological processes that may influence success in sport academies. Student engagement, self-regulation, and psychological need satisfaction are three psychological processes believed to influence students’ learning and development in sports education (see Figure 1) (Ryan & Deci, 2000; Shernoff & Vandell, 2007; Standage & Ryan, 2012; Vansteenkiste, Lense, & Deci, 2006). Student engagement was conceptualized as the student experience in sports education activities (Shernoff & Vandell, 2007). Researchers have reported positive relationships between engagement in sports and positive student outcomes, including satisfaction, volunteering in sports, and academic achievement (Dawson & Downward, 2013; Gayles & Hu, 2009). Self-regulation within academic domains has focused on the interactions between cognition, motivation and the environment (Dinsmore, Alexander, & Loughlin, 2008). Self-regulation in educational contexts is therefore defined as planning, monitoring and adapting such that students direct their attention towards goal achievement (Hadwin & Oshige, 2011). Researchers have revealed the prime importance of facilitating self-regulatory processes through physical education and sports to support and maintain health and well-being (Standage & Ryan, 2012). Finally, basic psychological needs theory (BPNT) can be used to explain behavioural and well-being outcomes (Deci & Ryan, 2000). Deci and Ryan (2000) contended that humans are born with key psychological needs for competence (i.e., person’s perception of successfully completing optimally challenging tasks), autonomy (i.e., person’s perception of agency and volition), and relatedness (i.e., person’s perception of belongingness). Satisfying these three psychological needs has been linked to sustained adaptive outcomes in physical education (Le Menestrel & Perkins, 2007; Standage, Duda, & Ntoumanis, 2005) and sport settings (Adie, Duda, & Ntoumanis, 2008; Sluder, Buchanan, & Sinelnikov, 2009). Until recently, Ethiopian sports academies have had no comprehensive data on students’ engagement in effective educational practices, their psycho-social characteristics, and the resulted outcomes gained. Due to this, little is known how learning occurs, the factors associated with student success, and how learning could be enhanced in Ethiopian sports academies. The significance of the aforementioned dictates the need for instrument development to address student engagement, self-regulation, and psychological need satisfaction in sport academy settings. One reason supporting the development of new instruments to capture the focal constructs of interest concerns the continued use of items modified from instruments developed for use in other contexts (e.g., education, exercise). Instruments outside the context (or target population) for which they were intended presents concerns based on item content relevance and/or representation (Crocker & Algina, 1986). Consequently, this study attempted to fill the existing gaps in the literature of this field through reporting on development and initial construct validation of three instruments used to gauge student engagement, self-regulation, and psychological need satisfaction in sports academies. Adopting a cross-sectional survey design, this study examined sports academy students’ responses to a survey questionnaire that measures student engagement, self-regulation and psychological need satisfaction. First, the researchers developed 21 engagement items, 32 self-regulation items, and 16 psychological need satisfaction items. The basis for item generation was theory and existing measures (Tadesse, Manathunga, & Gillies, 2018). After translation to Amharic, two reviewers with expertise in educational measurement and evaluation from Jimma University were asked to examine the domain relevance of items to determine whether each item loaded on its intended subscale. In addition, experts were asked to indicate any potential problems (e.g., item length or reading level) with each item. Twenty engagement items, 29 self-regulation items, and 16 psychological need satisfaction items received unanimous endorsement from the two reviewers, meaning that these experts believed the item addressed the intended subscale in each construct and was worded clearly. Items that appeared to be adequate indicators of their intended underlying construct were retained for the next stage of analysis. Two sports academies were selected using simple random sampling. The study was approved by the Ethiopian Youth Sports Academy Ethical Review Board. In each study site, permission to recruit students from the director of the sport academy was secured. In total, 410 students were eligible for participation on the basis of their enrolment in the two sports academies. Following research ethics clearance from the Ethiopian Youth Sport Academy, the researchers obtained verbal consent from the students’ guardians, and then distributed consent forms to students at each dormitory in the respective sports academies’ campuses. Although the number of students who received the consent forms cannot be determined, the assignment of two trained assistant data collectors at each sport academy and a door-to-door distribution of the questionnaire were instrumental in obtaining 274 returned consent forms. The dataset for the present study was extracted from the student engagement, self-regulation, and psychological need satisfaction scales designed to assess the key student-related factors that foster student outcomes in the sports academy context. An iterative process was undertaken for item generation by developing a pool of items from which new measures could be developed. The basis for item generation was theory (e.g., BPNT; Deci & Ryan, 2000) and existing measures (Asmamaw, 2014; Tadesse et al., 2018). Originally developed in English, the engagement, self-regulation, and psychological need satisfaction scales were translated to Amharic, which is a local language for use with students in Ethiopian sports academies. The translator was a language expert who was fluent in the source language of the instrument and native in the target language. The items followed an instructional stem asking participants to think about their experiences or behaviours exhibited. For example, active participation and team work items began with, ‘In your experience at your sports academy during the current year, about how frequently have you completed each of the following?’ and were scaled 1 (Never) to 4 (Very often). Instrument validation and scale refinement entailed four essential steps: (1) analysis of the synthesized version of the three scales by expert judges, (2) pilot testing to determine initial internal consistency/factorial validity evidence, (3) followed by descriptive statistics and confirmatory factor analysis (CFA) for construct validation of the three scales and (4) reliability analysis was conducted for each scale and sub-scale using Cronbach alpha (Cronbach, 1951). In this study, measurement models were specified a priori and each construct was analysed separately using CFA. Accordingly, items were allowed to load on only one hypothesized factor, factors were allowed to correlate freely, factor variances were set to one, and error terms were not allowed to correlate. The researchers conducted CFA for the whole sample at three stages. Model fit was assessed according to multiple indices. The Chi-square (x2) test was used to assess absolute fit of the model to the data, but this test often rejects models based on large samples (Bollen, 1989; Bollen & Long, 1993). To address this limitation, the Chi-square to degrees of freedom (x2/df) ratio was used. The x2/df ratios up to 5 have been used as general rules of thumb to establish reasonable fit (Marsh & Hocevar, 1985). Also, four other indices such as the Comparative Fit Index (CFI), the Tucker–Lewis Index (TLI), the root mean square error of approximation (RMSEA), and the standardized root mean square residual (SRMR) were used to judge model fit. The CFI and TLI range from 0 to 1 with the conventional value for acceptable model fit at .90 or greater (Bentler & Bonett, 1980; Bollen, 1989; Hu & Bentler, 1999). In interpreting RMSEA and SRMR, it was suggested that values less than .05 indicate close model fit, values between .05 and .08 indicate reasonable fit, those between .08 and .10 indicate mediocre fit, and values greater than .10 indicate unacceptable fit (Browne & Cudeck, 1992; Schreiber, Nora, Stage, Barlow, & King, 2006). Estimates of internal consistency for the total scale and each subscale were calculated using a pilot sample of reliability of volunteered first year undergraduate students of sports sciences department at Jimma University (N = 36). Based on the preliminary analysis, two items each from the student engagement scale and self-regulation scale were dropped. Estimates of internal consistency for the total scale scores exceeded α > .70 with subscale scores ranging from .73 to .89. These alpha coefficients are acceptable in the psychological research literature (Nunally & Bernstein, 1994). The factorial validity of the scores derived from the scales were assessed by examining the item-factor loadings from the main study data. Here items were considered for deletion if they displayed large standardized residuals (>2), if an item had a low factor loading <.40 (Kline, 1998). Two items from the student engagement scale, three items from self-regulation scale, and another two items from psychological need satisfaction scale produced a factor loading below .04 and were thus discarded. Of the 274 administered consent forms, 10 were deemed non-responders as they did not return the questionnaires. In addition, another 7 participants’ survey responses were discarded prior to data analysis because of partial response (i.e., around 50% of the necessary information was not completed). The study participants included in the final analysis were volunteered students (N = 257; Nmale = 135 and Nfemale = 122) from two sports academies in Ethiopia with Mage = 17.87 and SD = 1.10. In the present study, the researchers applied CFA analyses separately for the three constructs representing engagement, self-regulation, and psychological need satisfaction among study participants. As shown in Table 1, the mean scores for the student engagement range from 1.86 to 2.51. These scores were low to moderate scores. The skewness scores ranged from 0.12 to 0.79 and kurtosis scores ranged from -1.17 to -0.12, indicating non-normality in the data distribution, but within the acceptable range -2 ≤ X ≥ 2. Tables 2 and 3 contain the mean of the univariate skewness and kurtosis estimates for the items forming the self-regulation and psychological need satisfaction scales, respectively. As shown in Table 2, the mean scores range from 2.11 to 2.81. Table 3 also contains mean score values ranging between 2.11 to 3.01. The univariate skewness and kurtosis values (see Table 2 and 3) did not identify any serious violations of normality with the items used to measure the constructs. The different items used in each scale are presented in Tables 1, 2, and 3. Generated items loaded cleanly onto the appropriate factors representing each scale, and revealed the structure of a 16-item, 3-factor for engagement, a 24 item, 4-factor for self-regulation, and a 14 item, 3-factor for psychological need satisfaction. As shown in Figure 2, the item-factor loadings for student engagement scale range from .52 to .70. The item-factor loadings for self-regulation scale range from .63 to .77 (see Figure 3). The item-factor loadings for psychological need satisfaction range from .66 to .80 (see Figure 4). A closer examination of these measure variables shows that each item had a factor loading well above the recommended .40 level (Kline, 1998). Rectangles represent observed variables. Ovals represent latent variables. The εs’, are residual terms denote measurement errors. Single arrow head drawn from the oval to the rectangle represents the path connection between the measurement variable and the latent factor. The double head arrow drawn between two ovals represents correlation. The acronym csr represents coach-student relationship, apt represents active participation and teamwork, and eee represents enriching educational experience. Figure 3. Structural Representation of the Self-regulation Instrument. Rectangles represent observed variables. Ovals represent latent variables. The εs’, are residual terms denote measurement errors. Single arrow head drawn from the oval to the rectangle represents the path connection between the measurement variable and the latent factor. The double head arrow drawn between two ovals represents correlation. ‘mc’ refers to metacognitive Skills, ‘tse’ refers to time management and study skill, ‘peer’ refers to peer learning, and ‘help’ refers to Help seeking. Figure 4. Structural Representation of Psychological Need Satisfaction Instrument. Rectangles represent observed variables. Ovals represent latent variables. The εs’, are residual terms denote measurement errors. Single arrow head drawn from the oval to the rectangle represents the path connection between the measurement variable and the latent factor. The double head arrow drawn between two ovals represents correlation. ‘Autho’ represents autonomy, ‘comp’ represents competence, and ‘relate’ represents relatedness. Next, the structures of the constructs were examined through CFA performed in Stata 13 statistical and software analysis package, for the whole group. The model parameters were estimated using the maximum likelihood function. Additionally, a covariance matrix was analysed, fixing the latent variable variances to 1.0. The resultant CFA models were significant. The other indices suggested that the models are good fits to the data. Overall, the analyses support the adequacy of the models subscales. Within each instrument, sub-scales were moderately to strongly positively correlated with one another (p<0.000; see Figure 3, 4, & 5). As with the item-level data, the researchers re-examined the model for the scales levels analyses with a 3-factor student engagement, 4-factor self-regulation, and 3-factor psychological need satisfaction structure, and the model fit was considerably significant across measures (see Table 4). It is clear from the results that the 3-factor engagement, the 4-factor model of self-regulation, and a 3-factor model of psychological need satisfaction have a chi square to degrees of freedom statistic of 2.10 to 2.22, which indicates the adequacy of the models. Further, the CFI and TLI provided additional supporting evidence for the adequacy of the model. Moreover, the RMSEA of .061 and SRMR values of .042 indicate a good fit. The three-factor engagement model resulted in good fit to the 16-item engagement scale (x2/df ratio = 1.79, CFI = .92, TLI = .93, RMSEA = .055, SRMR = .048). The four-factor self-regulation model resulted in good fit to the 24-item self-regulation scale (x2/df ratio = 1.99, CFI = .91, TLI = .92, RMSEA = .062, SRMR = .046). The three-factor psychological need satisfaction model resulted in good fit to the 14-item psychological need satisfaction scale (x2/df ratio = 2.67, CFI = .92, TLI = .93, SRMR = .047), but the RMSEA = .081 indicates a reasonable fit. The reliability analysis for all the items used to measure each scale indicates that scores from each of the three scales ranged from α =.90 and .94. In terms of factor or sub-scale level reliability, the Cronbach alpha coefficient ranges between .74 and .90 (see Table 1, 2 & 3). 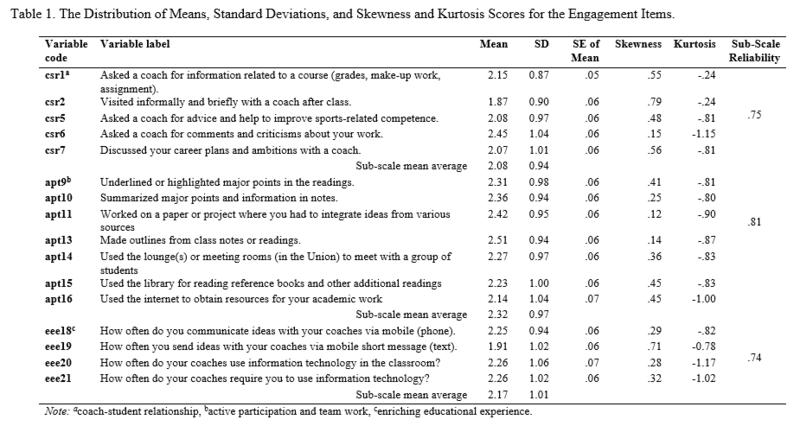 Cronbach’s alpha coefficients for scores associated with the 10 subscales were Coach-student relationship = .79, Active participation and teamwork = .81, Enriching educational experience = .74, Metacognition = .90, Study time management = .89, Peer learning = .80, Help seeking = .80, Autonomy = .83, Competence = .86, and Relatedness = .83. Development of a measure of a construct requires validation of the hypothesized relationship between the construct and its indicators. In the present study, the researchers applied multi-method validation approach comprising of translation, expert evaluation, and a number of validity checks using CFA separately for the three constructs representing engagement, self-regulation and psychological need satisfaction among a sample of sports academy students in Ethiopia to assess the dimensionality of these three instruments separately. In brief, this investigation provided initial evidence supporting the viability of three instruments to measure each of their intended constructs in sport academy participants. In brief, this investigation provided initial evidence supporting the viability of scores from instruments of student engagement, self-regulation, and psychological need satisfaction as experienced in sports academy. In investigating the statistics and fit indices, a 3-factor solution of student engagement, a 4-factor solution of self-regulation, and a 3-factor solution of psychological need satisfaction were shown to be adequate for the measured three scales. These results support the factorial validity and reliability of scores from the three instruments. As research validation is an on-going process, researchers would do well to offer support for invariance of instrument scores across meaningful characteristics (e.g., gender). Further evidence for the construct validity of instrument scores should be generated in relation to other important outcomes such as students’ sporting performance, perceived gains, satisfaction, students’ study strategies, and the quality of students’ learning and development. Analyzing the internal consistency between items, evaluating the precision (reliability & dependability), in addition to evaluating the consistency of the measurement at different times (temporal stability), are ways of finding evidence of validity of the adapted instrument. This study was not without limitations and the following limitations need to be considered for cautious conclusions. First, this study used negatively worded items to measure aspects of self-regulation subscale that may be attributed for the complete rejection of those negatively worded items as their factor loadings were below the recommended levels. Second, this study used simple probability-based sampling methods. Researchers should consider adopting more sophisticated sampling strategies to enhance the external validity of the data. Moreover, the study applied the measurement of psychometric quality for the total sample. The present study provides evidence for the factorial validity of the three measured constructs including, engagement, self-regulation, and psychological need satisfaction among students in sports academies in Ethiopia. Consistent with prior research utilizing these three instruments, the scales appear to be valid and reliable. These student-related psycho-social factors represent potential malleable targets for interventions to maximize adolescents and youths who continue learning sports education programs. It is argued that, to advance understanding of the personal factors that foster student outcomes in sports academy programs, a shift towards a multidisciplinary and integrative focus is necessary, along with the development of a comprehensive multidisciplinary theoretical rationale (Lewis, 2014; Lyras & Peachey, 2011; Rynne, Mallett, & Tinning, 2006). Here the researchers elucidate three theories as theoretical rationale for capturing how multiple interacting domains can form the basis to shape the learning and development of sports academy students. Researchers would do well to examine these three constructs in relation to other important outcomes such as students’ sporting performance, perceived gains, satisfaction students’ study strategies, and the quality of students’ learning and development. Although most researchers agree that it is necessary to have multiple indicators of the three constructs-particularly for personnel decisions-it is critical that the validity of the indicators of the three constructs be systematically examined before they are actually used. Subsequent use and analysis of data from this questionnaire can provide sports academic institutions with information for understanding the students’ overall educational experience, self-regulations and psychological need satisfaction as well as tracking changes in sports academy student perceptions. This can be done by comparing indices over time (Tadesse & Gillies, 2017). For example, the model could be used as the baseline for different kinds of longitudinal studies conducted in relation to these constructs. It is important to repeat the assessment practice of sports academy student perceptions over time in order to monitor the gaps and diagnose the happenstance of new experiences or psycho-social behaviour that may exist as time goes. This article is part of the research project, which is fully funded by the Ethiopian Youth Sport Academy. We are grateful to the Ethiopian Youth Sport Academy support. Moreover, we are indebted to the students’ participants of Ethiopian Youth Sport Academy and Tirunesh Dibaba Sport Academy who took their time and energy to complete the survey. 1. Adie, J., Duda, J., & Ntoumanis, N. (2008). Autonomy support, basic need satisfaction and the optimal functioning of adult male and female sport participants: a test of basic needs theory. Motivation & Emotion, 32, 189-199. doi: http://dx.doi.org/10.1007/s11031-008-9095-z. 2. Asmamaw, A. (2014). Assessment of students epistemological belief and self-regulation in the Ethiopian public Universities. ((Doctoral Dissertation)), Andhra University, Vishakhapatnam. 3. Asmamaw, A., H/mariam, S., & Tadesse, T. (2016). Assessing Institutional Practices and Conditions in the Development of Students in Ethiopian Sports Academies– Insiders’ Perspectives. International Journal of Current Research, 8(7), 34099-34108. 4. Balderson, D. (2012). Sport Academies and the Physical Education Curriculum. Paper presented at the CUPR, PHE Canada Conference. 6. Bollen, K. A. (1989). Structural equations with latent variables. New York, NY: Wiley. 7. Bollen, K. A., & Long, J. S. (1993). Testing structural equation models. Newbury Park, Calif: Sage Publications. 10. Crocker, L. M., & Algina, J. (1986). Introduction to classical and modern test theory / Linda Crocker, James Algina. New York: New York : Holt, Rinehart, and Winston. 13. Dawson, P., & Downward, P. (2013). The relationship between participation in sport and sport volunteering: an economic analysis. International Journal of Sport Finance, 8(1), 75. 14. Deci, E., & Ryan, R. (2000). Self-determination theory and the facilitation of intrinsic motivation, social development, and well-being. American psychologist, 55(1), 68-78. 18. Gayles, J. G., & Hu, S. (2009). The Influence of Student Engagement and Sport Participation on College Outcomes among Division I Student Athletes. Journal of Higher Education, 80(3), 315-333. 20. Hadwin, A., & Oshige, M. (2011). Self-Regulation, Coregulation, and Socially Shared Regulation: Exploring Perspectives of Social in Self-Regulated Learning Theory. Teachers College Record, 113(2), 260-264. 22. Jones, M. I., Dunn, J. G. H., Holt, N. L., Sullivan, P. J., & Bloom, G. A. (2011). Exploring the ‘5Cs’ of positive youth development in sport. Journal of Sport Behavior, 34(3), 250. 23. Kline, R. (1998). Principles and practice of structural equation modeling. New York: Guilford Press. 24. Lewis, A. (2014). Developing Sport Psychology in a girls’ sport academy curriculum. South African Journal of Education, 34(2), 1-16. 26. Marsh, H. W., & Hocevar, D. (1985). Application of confirmatory factor analysis to the study of self-concept: First-and higher order factor models and their invariance across groups. Psychological Bulletin, 97(3), 562-582. 28. Nunally, J., & Bernstein, I. (1994). Psychometric theory (3rd ed. ): New York: McGraw Hill. 29. Paul, D. (2012). Gains Versus Drains: Football Academies and the Export of Highly Skilled Football Labor. The Brown Journal of World Affairs, 18(2), 265. 30. Richards, K. A. R., & Levesque-Bristol, C. (2014). Student learning and motivation in physical education. Strategies: A Journal for Physical and Sport Educators, 27(2), 43. 31. Ryan, R., & Deci, E. (2000). Intrinsic and extrinsic motivations: Classic definitions and new directions. Contemporary Educational Psychology, 25(1), 54-67. 36. Standage, M., Duda, J. L., & Ntoumanis, N. (2005). A test of self‐determination theory in school physical education. British Journal of Educational Psychology, 75(3), 441-433. 37. Standage, M., & Ryan, R. M. (2012). Self-determination theory and exercise motivation: facilitating self-regulatory processes to support and maintain health and well-being. In G. C. Roberts & D. C. Treasure (Eds. ), Advances in motivation in sport and exercise (3rd ed., pp. 233-270). Champaign, IL: Human Kinetics. 51. Vansteenkiste, M., Lense, W., & Deci, E. (2006). Intrinsic versus extrinsic goal contents in self-determination theory: Another look at the quality of academic motivation. Educational psychologist, 41(1), 19-31.